Imagine you have a flashback to the most terrifying moment you’ve ever experienced. Imagine you have nightmares, anxiety, depression, and panic attacks. You can’t eat, you can’t sleep, you can barely think. Imagine you are feeling isolated, alone, and confused. If you have PTSD you won’t have to use your imagination, because this very well could be your reality. The Mayo Clinic defines Post Traumatic Stress Disorder (PTSD) as a mental health condition triggered by a terrifying event. Symptoms include flashbacks, nightmares, insomnia, depression, and severe anxiety. While most people are familiar with the term PTSD, a lot of people don’t understand the full impact PTSD has made on our society and on veterans particularly. Here’s some quick bullet points on PTSD to get everyone up to speed. Today there’s a wealth of resources available for dealing with PTSD, but it wasn’t always that way. PTSD wasn’t formally diagnosed until 1980, but there is evidence of PTSD symptoms scattered throughout history and literature. Famous authors like Shakespeare, Dickens, and even all the way back to Homer all have a few references to PTSD in some of their writings. However, when these authors were writing, the words post traumatic stress disorder didn’t exist. Before efforts to diagnose mental conditions like PTSD were around, PTSD was often written off as a weakness that could be overcome with willpower. The first evidence of diagnoses attempts started in 1761, and PTSD would take on several names from then on, until we finally get to the formal diagnosis in 1980. Here’s a quick look at the path PTSD took to get to where we are today. Nostalgia 1761– Dr. Josef Leopold, an Austrian physician, wrote about veterans who experienced “nostalgia” while at the battle field. These veterans reported sleeping problems, being home sick, and depression. Soldier’s Heart 1862– During the American Civil War the term “soldier’s heart” was coined to describe soldiers with rapid heart beat and other cardiac conditions after being exposed to military trauma. Shell Shock 1919– After World War I veterans who were around artillery shells were thought to have “shell shock” syndrome. This was characterized by panic attacks and trouble sleeping. Most doctors thought shell shock was caused by damage to the brain from impact of big guns. Battle Fatigue 1945– During WWII shell shock was switched to “battle fatigue.” This condition was thought to be caused by the long battles and surges that were common during WWII. Several prominent US leaders, including General Patton, did not believe battle fatigue was real condition. Gross Stress Reaction 1952– The American Psychiatric Association (APA) first mentioned “gross stress reaction” in the 1952 edition of Diagnostic and Statistical Manual of Mental Disorders (DSM-I). While this condition was similar to PTSD, it assumed the condition was only temporary. If the symptoms lasted more than six months, it had to be another condition. PTSD 1980– Finally, in 1980 the APA listed PTSD in DSM-III. This resulted from tests and research involving Vietnam vets, sexual trauma victims, and even Holocaust survivors. Once doctors finally started calling PTSD what it is, they tried to figure out what caused it. They were, and still are to some extent, confused why some soldiers get PTSD and others don’t. Why is it that two soldiers could fight in the same battles, have the same experiences, and suffer the same losses, yet one gets PTSD and the other doesn’t? The Mayo Clinic may have the answer. According the to Mayo Clinic PTSD is most likely caused by a combination of different conditions and circumstances. To do a proper study of PTSD, doctors studied all sorts of people, not just veterans. Victims of abuse, sexual assault, and other traumatic experiences are all susceptible to PTSD. So for veterans, PTSD can be caused by a long list of events. Anything from witnessing a fellow soldier die in combat to constantly hearing gunfire and explosions can cause PTSD. There are also several non-combat stressors of PTSD. Sadly, there’s no pill or shot that can cure PTSD. The recommended treatment is therapy. There are different forms of therapy that can help Veterans with PTSD. Cognitive therapy- This kind of therapy helps veterans understand how their thoughts work and how those thoughts can trigger a panic attack or mood swing. Once these thoughts are identified they can be suppressed or replaced with more pleasant thoughts. Exposure therapy- The goal of this therapy is to help veterans feel less stress about their trauma. By talking through their trauma with a professional, veterans can come to terms with what happened and learn how to overcome it. Group therapy- Similar to exposure therapy, groups therapy provides a setting for veterans to talk through their issue, but in this case veterans talk with other veterans and provide support for each other. Certain medication has also shown to be effective in treating the depression and anxiety that comes with PTSD. The VA does offer benefits for veterans with PTSD. 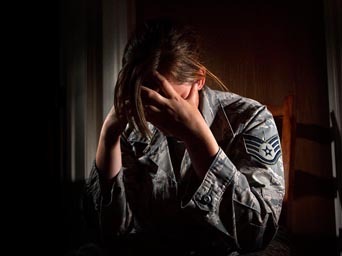 It can a little tricky to get benefits for PTSD, but it’s not impossible. Here’s what the VA requires for veterans to get benefits for PTSD. A PTSD diagnosis from a qualified doctor. A stressor that caused the PTSD has been identified. The stressor is service connected. Just like a physical disability, the VA assigns a disability rating to veterans with PTSD. This rating is a percentage based on how severe the PTSD affects the veteran’s ability to work and interact with society. The higher the rating, the higher the benefit payments are. One of the hardest parts of beating PTSD is taking the first step to get help. Veterans feel ashamed and alone in this fight, but they’re not alone and there’s nothing to be ashamed of. Jan Dils Attorneys at Law helps veterans with PTSD benefits everyday and they offer free case evaluations for any veterans struggling with PTSD.